I have long seen the impact of emotional intelligence in sales success. I see sellers who are successful because they are resilient, one aspect of emotional intelligence. I also see sellers who aren’t as successful because of low emotional intelligence. 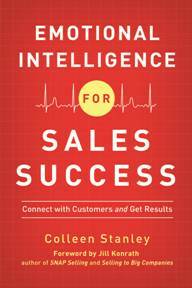 That’s why the new book by Colleen Stanley, is a great read – Emotional Intelligence For Sales Success. In it, she shares tips and expert insights on areas of the sales process where soft skills affect your hard sales results. You see, Emotional Intelligence (EQ) impacts everything in sales! Have you ever found yourself caving in to a discount, jumping the gun with your presentation, getting flustered with a client, or wasting time with low-level prospects? We’ve all been there. We know what to do, yet for some reason, we don’t do it. To close the gap between knowing and doing, my friend and colleague Colleen Stanley recommends you use your Emotional Intelligence ― your ability to identify, assess, and control your emotions and others ― in every selling situation. The good news is: Emotional Intelligence can be learned. You can develop and improve your skills with focus and commitment. I recommend that you start by reading Colleen’s book. Read the first chapters now and test your Sales EQ here. P.S. When you buy the book, make sure to read “Chapter 5: You Get What You Expect” at least twice – it will change your customer relationships forever. Check out Emotional Intelligence for Sales Success -you won’t regret it, it could be THE link to changing the trajectory of your career. P.S.S. – I do not receive any compensation for this recommendation.